The Samsung Galaxy S9 and Samsung Galaxy S9+ are Android smartphones produced by Samsung Electronics as part of the Samsung Galaxy S series. The devices were revealed at the Mobile World Congress in Barcelona on 25 February 2018, as the successors to the Samsung Galaxy S8 and S8+. Original: Samsung Experience 9.0 on top of Android 8.0 "Oreo"
Current: One UI 1.0 on top of Android 9.0 "Pie"
S9: 7001120000000000000♠12 MP (6994140000000000000♠1.4 μm, f/1.5/2.4), OIS, 4K at 30 or 60 fps (limited to 5 min), QHD at 30 fps, 1080p at 30 or 60 fps, 720p at 30 and super slow motion at 960 fps (for 0.2 seconds). S9+: Dual 7001120000000000000♠12 MP (6994140000000000000♠1.4 μm, f/1.5/2.4) + 12 MP ((6994100000000000000♠1.0 μm), f/2.4), Dual OIS, 4K at 30 or 60 fps (limited to 5 min), QHD at 30 fps, 1080p at 30 or 60 fps, 720p at 30 fps and super slow motion at 960 fps (for 0.2 seconds). 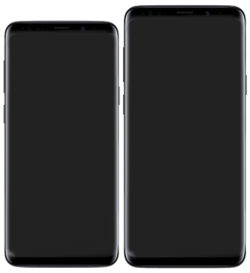 The Galaxy S9 and S9+ have nearly identical features to the S8 batch, with the same display size and aspect ratio, just like their predecessor. One highly regarded change to distinguish between the models is the location of the fingerprint sensor. While the S8's is found beside the camera, the S9's is directly underneath it. Most notably, however, the S9 line is equipped with several camera improvements over the S8. Many Galaxy S9 features and design changes were leaked weeks before the official launch, and the official launch video was leaked a few hours prior to the unveiling. On the front, the Galaxy S9 and S9+ look identical to the S8 and S8+. They both feature 1440p Super AMOLED displays, with an 18.5:9 aspect ratio. The S9 has a 5.8-inch panel, while the S9+ uses a larger 6.2-inch panel. In most countries, the S9 and S9+ both come with a Samsung Exynos 9810 SoC. Versions sold in the United States, Canada, China, Hong Kong, Japan, and Latin America come with the Qualcomm Snapdragon 845 SoC instead. The cameras on both phones received improvements. The S9+ has a dual-lens camera setup on the back, like on the Galaxy Note 8, while the S9 only has a single camera on the back. Both phones have a Dual Aperture rear camera which can switch between f/1.5 and f/2.4, depending on lighting conditions. The phones can shoot 4K at 60 frames per second (limited to 5 min), 1080p at 240 frames per second and 960 frames per second "Super Slo-Motion " video at 720p for 0.2 seconds. AR Emoji, similar to Apple's Animoji feature on the iPhone X, is a new feature that lets the user make emojis based on themselves. Third party app support is provided for this feature. There are also several construction improvements compared to S8 and S8+ models, mostly to increase physical durability, such as thicker glass, thicker metal rim and different (less prone to deformation) metal alloy used for the frame. The S9 and S9+ ship with Android 8.0 "Oreo" with the Samsung Experience user interface and software suite. It is mainly unchanged over the versions found on the S8 and Note 8, but adds additional features such as new customization options, live language translation in the camera app, and landscape orientation support for the Samsung home screen. In January 2019, Samsung began to release Android 9.0 "Pie" for the S9. This update introduces a major revamp of Samsung's Android user experience known as One UI. A main design element of One UI is intentional repositioning of key user interface elements in stock apps to improve usability on large screens: many apps include large headers that push the beginning of content towards the center of the display, while navigation controls and other prompts are often displayed near the bottom of the display instead. John McCann from Techradar complimented the improved camera and the new location of the fingerprint sensor, but criticized that it was too similar to its predecessor (Galaxy S8) and had limited AR Emoji functionality. Brian Heater of TechCrunch reviewed the S9+ on 8 March 2018, and said that the phone is built on the "success [of the S8] in a number of ways". Computer World gave the phone a positive review and said it was "measurably better than its predecessor", but did note there wasn't a new feature that was particularly "exciting". PC Magazine also gave the Galaxy S9 and S9+ positive reviews. CNBC's Todd Haselton said on 8 March that the S9+ was superior to the S9, for reasons such as the larger screen and second camera, as well as more RAM and battery power. Samuel Gibbs from The Guardian gave the S9+ 5/5 stars, with the headline it was "the best big-screen smartphone by miles". Screen and camera were praised, but the review noted battery life could be better. He also appreciated the inclusion of a headphone jack, despite many other phones not having one. The larger S9+'s camera received a score of 99 from DxOMark, which, at the time was the highest score awarded by them to a mobile device camera. It was soon surpassed by the Huawei P20 and P20 Pro, which scored 102 and 109 respectively. Dan Seifert of The Verge gave the S9 a score of 8.5, stating that its performance, camera and design were satisfactory. However, he was not amused by the average battery life and the addition of Bixby, also saying that Samsung has a poor history of updating their smartphones. Samsung has described the sales of the Galaxy S9 as "slow" in their Q2 2018 earning report. Analysts predicted that the phone would be the worst selling Galaxy S flagship since the Samsung Galaxy S5. According to 더벨 - 국내 최고 자본시장(Capital Markets) 미디어 about 31 million of the Samsung Galaxy S9 were shipped from those 10 million units were sold worldwide. About a week after the release of the devices, users started experiencing an issue in the touchscreen, where it would fail to register input in any particular area of the screen, even after a factory reset. This was termed as "dead zones" by the users. Samsung has responded by issuing a statement that they were "looking into a limited number of reports of Galaxy S9/S9+ touchscreen responsiveness issues". Some users of the Galaxy S9 have reported the so-called "Black Crush" issues, where the display has issues displaying different shades of dark colors. Samsung has responded with a statement that they are aware of "a limited number of reports of Galaxy S9/S9+ displaying dark colors differently than intended in certain instances" but has not provided an official fix for it yet. Many users with the Exynos variant of the phone experienced subpar battery life. Analysts discovered that the four Samsung-designed cores had been poorly tuned, resulting in decreased battery life. This issue, however, has been addressed in part with the release of the August 2018 update. In previous Galaxy S phones, the Exynos processor performed similar to the Snapdragon version. In the S9, the Exynos 9810 performed relatively slowly for a flagship and compared to the Snapdragon 845. This was not very evident in synthetic benchmarks, but more so in benchmarks that simulated real world performance, such as PCMark. ^ a b c "The S9 records 4K 60fps in high-efficiency codec, but no more than 5 min". Phone Arena. ^ "Samsung announces the Galaxy S9 launch, teases "reimagined" camera". Ars Technica. Retrieved 30 January 2018. ^ "Everything we think we know about the Samsung Galaxy S9". The Verge. Retrieved 24 February 2018. ^ "Samsung's Galaxy S9 launch video leaks out". The Verge. Retrieved 25 February 2018. ^ a b c d "Review: Samsung's new Galaxy S9 phones make excellence routine". computerworld. 12 March 2018. ^ "Samsung Galaxy S9 review: A fantastic phone for the masses, but not an exciting one". Android Central. 8 March 2018. Retrieved 3 April 2018. ^ a b "Galaxy S9 Vs. S9 Plus: Which One Should You Buy?". forbes. 13 March 2018. ^ "Samsung Galaxy S9 Specifications". Samsung. Retrieved 31 August 2018. ^ a b "Samsung Galaxy S9 review". gsmarena. 9 March 2018. ^ "This is the best look at the Galaxy S9's variable aperture you'll ever get". theverge. 13 March 2018. ^ "Galaxy S9: What you need to know about AR Emoji". CNET. 13 March 2018. ^ "Samsung's Galaxy S9 Has A Great Secret Feature". Forbes. 1 March 2018. ^ "Samsung Galaxy S9 and S9+: Everything you need to know, all in one place". PC World. 2 April 2018. ^ Bohn, Dieter (29 January 2019). "Samsung begins US rollout of Android 9 Pie and One UI, but slowly". The Verge. Retrieved 20 February 2019. ^ Bohn, Dieter (19 February 2019). "Samsung's One UI is the best software it's ever put on a smartphone". The Verge. Retrieved 20 February 2019. ^ Tibken, Shara. "Samsung redesigns its smartphone user interface with One UI". CNET. Retrieved 20 February 2019. ^ McCann, John. "Hands on: Samsung Galaxy S9 review". techradar. Retrieved 26 February 2018. ^ "Samsung's Galaxy S9 Plus earns best-ever DxOMark camera ratings". CNET. 1 March 2018. Retrieved 28 March 2018. ^ Salman, Ali (27 March 2018). "Huawei P20 Pro Features DxOMark Score Greater Than Any Other Smartphone To Date". Wccftech. Retrieved 28 March 2018. ^ "Samsung Galaxy S9 review: predictably great, predictably flawed". The Verge. Retrieved 19 March 2018. ^ "Samsung says the Galaxy S9 isn't selling very well". The Verge. Retrieved 1 August 2018. ^ "Galaxy S9 screen not responding? Here's how to let Samsung know". CNET. Retrieved 3 April 2018. ^ "Samsung Galaxy S9 and S9 Plus touchscreen issue causing havoc on some handsets". Android Authority. 22 March 2018. Retrieved 23 March 2018. ^ "Samsung is 'looking into' Galaxy S9 touchscreen issues". Engadget. Retrieved 23 March 2018. ^ Elder, Duncan. "Some Galaxy S9 Plus users are reporting "black crush" screen issues". Android Authority. Retrieved 14 June 2018. ^ Michaels, Philip. "Galaxy S9 Screen Complaints Grow (Update: Samsung Responds)". Tom's Guide. Retrieved 14 June 2018. ^ Bader, Daniel (3 April 2018). "Samsung Galaxy S9 battery problems, explained: Exynos vs. Snapdragon". Androidcentral. Retrieved 8 June 2018. ^ "Battery Life Of Exynos Galaxy S9 Models Improved With New Patch | Android News". AndroidHeadlines.com |. 15 August 2018. Retrieved 22 October 2018. ^ "Galaxy s9+ smartphone review". notebookcheck. Retrieved 29 January 2019. ^ "Improving the Exynos 9810". Anandtech. Retrieved 29 January 2019.